In 2011, approximately 24,790 U.S. workers suffered an eye injury or illness requiring a median of two days away from work, according to recent data from the Bureau of Labor Statistics. Providing workers with appropriate hazard-based eye protection is critical to injury prevention, notes Larry L. Jackson, chief of the Injury Surveillance Team for the Surveillance and Field Investigations Branch of NIOSH’s Division of Safety Research. However, this does not necessarily mean workers will use the provided personal protective equipment. Many workers incorrectly believe one type of PPE will protect them from all eye injuries. According to the National Safety Council’s “Fundamentals of Industrial Hygiene,” 6th edition, some workers believe their corrective eyewear can protect them from injury, giving them a false sense of security. Jackson said workers also may be unaware of the potential severity of eye injuries, which are “often perceived as only being minor.” In truth, the eye is much more likely to suffer permanent injury than a body part such as a finger because the unique tissues that make up the eye are not present elsewhere in the body. Another factor leading to non-compliance is the belief that eye protection reduces productivity or safety in other areas, such as fogging leading to a fall, Jackson said. Additionally, some workers find eye protection uncomfortable or unstylish. From CDC: Each day more than 2,000 U.S. workers receive some form of medical treatment because of eye injuries sustained at work. More than 800,000 work-related eye injuries occur each year. Review applicable OSHA eye safety standards and learn about common eye safety hazards in their industry. Identify hazard sources by walking through a work area and speaking with employees, including asking about hazards at all times of the day. Evaluate ways to mitigate eye safety hazards at the root cause, reducing the need for employees to use PPE. 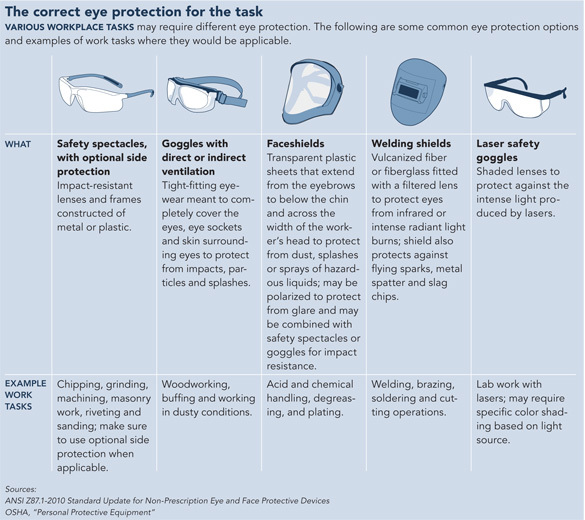 Look to the ANSI standards for each hazard to determine appropriate eye protection. Consult with workers on their eyewear preferences, and offer a variety of styles and sizes to increase the likelihood that employees will find the eyewear appealing. Incorporate employee input into training programs and written eye safety plans. Ensure supervisors and health and safety staff serve as role models when implementing or updating an eye safety plan by wearing the same eye protection as employees. Ultimately, safety professionals should establish a culture where eye protection is the norm. “Culturally, wearing eye protection must become equivalent to a construction worker wearing a hard hat – a symbol of who they are and what they do, one that they don’t leave home without, and that they can’t start work without,” Jackson said. Not wearing eye protection can result in permanent blindness. Edward Bernacki, professor of medicine and chair of the joint committee on health, safety and the environment for the Johns Hopkins Health System and University in Baltimore, described an incident in the 1990s in which a graduate student who was not wearing eye protection suffered permanent blindness following a lab explosion. The individual was unable to work in the lab again, he said.